When you create a website, you need to encourage people to visit it regularly if you want to make it successful. Whatever you offer on your site, regular clicks on it is essential. It’s a very complicated process as you need to explore the areas where people click and you have to provide the required content there as soon as possible. So, the biggest question is how can you know the “exact locations” on your site where people tend to visit frequently? Well, it can easily be done with the help of heatmaps. In fact, heatmaps are website tracking tools that give you a detailed report on how visitors are interacting with your site. It helps you to easily understand which areas of your site are preferred mostly by visitors and which areas are getting the unenthusiastic response from the targeted audience. Based on the outcome, you can make improvements in your site design, content marketing strategy, digital marketing campaigns, etc, to achieve the end goal of your web-based business. There are different types of heatmaps such as mosaic plot, treemap, biological heat maps, web heat maps, etc. Depending on your liking, you can choose any one of them and add that to your site. As the number of clicks is a clear indication of user’s engagement with your content, heatmaps mark your website with following red, yellow, green, and blue colors. The red indicates the higher number of clicks and yellow reflects the lower number of clicks on your site. Heatmaps are created easily by loading a JS file in the visitor’s browser when they land on your site. The JS file gets connected to WordPress site database and records the visitor’s activity on your site. If your website gets lots of traffic and you install a heatmap on the same server, additional recourses will be required. It can make your site slow and downgrade its performance up to a great extent. So, you should keep this factor in mind and arrange extra bandwidth to operate your site easily and smoothly. How to add heatmaps to your WordPress site? There are various heatmap tools/plugins. First of all, you need to have a look at some heatmap tools and choose the one which suits your needs and budget at best. If you want to use the heatmap for a single site, you can go for the free options. In case, you run multiple WordPress sites, you should opt for the premium options for obtaining better results. To choose a heatmap plugin, go to your WordPress site dashboard> plug-in >Add New and type the name of the heatmap plugin/tool. 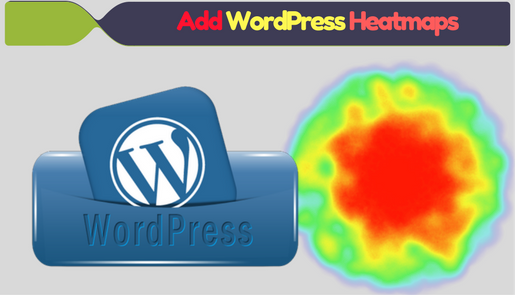 After choosing a specific heatmap plugin/tool, just install it on your WordPress site. As soon as the installation process is over, look for the new heatmap tab in your site’s dashboard. Just activate the plugin and go to the settings page. Now, you need to go to the “settings” option and sign up for your heatmap account by providing your website URL and Email address. Create a strong password for your account. By now, you have successfully installed the heatmap plugin on your site. When you install a heatmap plugin on your site, naturally you get excited to know where visitors are clicking on your site. As a result, you make several experiments without any planning, thus gaining no substantial clue out of that. Therefore, you should remember a few things in mind while using the heatmap tool to test the performance of your website or its pages. All pages available on your site must have a definite goal, such as converting visitors into loyal subscribers/buyers/readers, improving the social share of pages, readership, downloading of E-products, etc. So, before using the heatmap plugin, you should have a proper goal in your mind for each and every page of your site. For instance, if you are receiving lots of traffic to a specific webpage and you want to convert visitors into subscribers, you should display the signup form at the end of the content using widgets. But, when you come to know that visitors are landing to that specific post through “ related post section”, then you may remove your “Related Posts” widget and make the necessary arrangements in your site so that visitors can easily access that post. This may help you get more clicks on your site. It is recommended that you should not make major changes to your site to evaluate the effects of a few clicks. Just wait and watch & run your heatmap for at least 2000-3000 clicks for a week. If you get fewer clicks, then you should make the required changes. This is an all-inclusive guide on heatmaps and how you can use on your WordPress. Just install a heatmap tool/plugin on your WordPress site using the above-mentioned guidelines and increase its CTR profoundly using the inputs provided by it. Tracey Jones is a renowned WordPress Developer at HireWPGeeks Ltd. She assists her clients when they need to hire WordPress developer for their WP customization projects. When she is not busy with coding, she loves sharing useful tutorials regarding WordPress and its benefits. You can follow her company on social networks such as Twitter, Facebook, and LinkedIn.